My analysis of the information summarized in this essay has led me to conclude that the surname Norfleet first arose in Kent County, England and was derived from the name of the Manor and Parish of "Northfleet." I suspect that the first Norfleet immigrant to America, Thomas Northfleete, who settled in Virginia Colony about the year 1666, came from Northeast Kent in the vicinity of the towns of Faversham and Canterbury. Unfortunately, I have not yet been able to conclusively identify the specific family or the exact place of origin in England. Before the nineteenth century, the primary administrative divisions of the County of Kent were the Lathes, which originally were provinces in the ancient Jutish Kingdom of Kent. The lathes were subdivided into Hundreds, which originally meant territorial groupings of approximately a hundred families. The Hundreds were, in turn, divided into parishes, the smallest unit of ecclesiastical and political administration. The Parish and Vestry: From the sixteenth century to well into the nineteenth century, the parish was the basic unit of civil local government in England. In the Middle Ages the manor had been the dominant organizing element of local political government, while the parish had been strictly a unit of local Church government. However, in the 1530s, after King Henry VIII had assumed the role of head of the Church of England, the parish governing body (the vestry) was given certain secular, political responsibilities. Over time, more and more responsibilities were added, until by the beginning of the seventeenth century the parish vestry had assumed tasks such as poor relief, local tax gathering, road maintenance, and regulation of privately owned land boundaries (processioning). These vestries were usually composed of twelve of the most important men of the parish, usually individuals who were members of the local gentry. Indeed, vestrymen were always referred to as "Gentleman of the Vestry." Churchwardens: The senior members of the vestry were the churchwardens who were usually two in number and were elected on an annual basis. Their primary responsibilities included management of the parish accounts and the setting of church and other local tax rates.Churchwardens: The senior members of the vestry were the churchwardens who were usually two in number and were elected on an annual basis. Their primary responsibilities included management of the parish accounts and the setting of church and other local tax rates. Parish Vicar: The parish vicar/rector was also given certain official responsibilities; in particular, he was charged with the keeping of parish registers re baptisms, marriages and burials. From 1598, he was required to send a copy of one years register entries to his bishop; this was usually done at Easter time. The parish concept of local government, including the use of vestries and churchwardens, was imported into Colonial Virginia in the first half of the 17th century; this concept is further discussed in my essay on the Norfleets of Colonial Virginia and North Carolina. 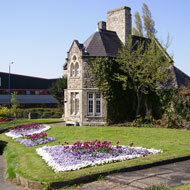 Since Anglo-Saxon times, Northfleet had been both a manor and a parish. The Parish of Northfleet is part of the Lathe of Aylesford, and the Hundred of Toltingtrough. The parish is located on the south bank of the upper portion of the Thames estuary and derives its name from its one time location near a "fleet," which in Old English was spelled "fleot." The word meant an arm of the Thames which, in those early days, flowed from Northfleet southward towards the Parish and manor of Southfleet. The Parish of Northfleet has one of the earliest and most complete set of parish registers, having entries going back to the year 1539. "The same Archbishop holds in demesne NORFLVET. It answered for six sulungs in the time of King Edward. And now for five. There is arable land for 14 teams. In demesne there are 2 teams. And 36 villeins have 10 teams. A church there. And 7 slaves. And one mill of 10 shillings and one fishery. And 20 acres of meadow. Wood of 20 hogs. In total value in the time of King Edward it was worth �10. When he received it, �12. And now �27. And yet it renders �37.10s." In the above entry, the Archbishop (of Canterbury) is said to "hold" the estate not own it; in those days only the King could own (hold title) to land. Others held their property as a tenant directly or indirectly from the King. The Archbishop is a tenant-in-chief meaning that he held the land directly from the King. A tenant-in-chief might grant an estate to a secondary tenant; however, in the case of Northfleet, the manor was kept in the hands of the Archbishop, i. e., "in demesne." In the time of King Edward the Confessor (the predecessor of William I), the manor had been taxed at the rate of six sulungs, but was currently being taxed at the reduced rate of five sulungs. The sulung was a unit of taxation unique to Kent; elsewhere it was called a "hide" or "carucate." The term means an amount of land that can be worked by one plough-team composed of eight oxen, probably about 160 acres. The assessed value of the estate had actually increased from �10 to �27 during this period. In spite of the fact that the assessed value of the estate had increased since King Edwards time, Northfleet was now being taxed at the reduced rate of only five sulungs. This probably indicates that Archbishop Lanfranc of Canterbury, a close friend of King William, was receiving the reduced rate as a royal favor. The manor of Northfleet continued to be in the "demesne" of the Archbishop of Canterbury until the 29th year of King Henry VIII, when it was conveyed back to the King by Archbishop Cranmer and later sold to private individuals. It should be noted that many of the Norfleets mentioned in the English records, during the Middle Ages, show a close connection with the See of Canterbury. Today, the modern town of Northfleet is an industrial area near Greater Metropolitan London, adjoining Gravesend on its western side, with Swanscombe and Southfleet lying to the east. Since the early Twentieth Century, the primary industry has been the production of cement. In April 1995, I visited Northfleet and found it to be rather unimposing, just a working class district located near the cement factories. However, the ancient Parish Church,Saint Boltoph's (see above photograph) is very picturesque. The church is located near a craggy chalk cliff, overlooking a wooded quarry. This church is basically a fourteenth century structure, with some evidence of much earlier Saxon masonry. The restored stained glass windows reflect typical Kentish geometrical tracery and the chancel screen dates to 1313. In Roman and Medieval times, the town of Canterbury was the point of convergence for the roads from the ancient Kentish, cross-channel ports of Lympne, Dover and Richbourgh. From Canterbury, there was a main Roman road, famous throughout the Middle Ages, which ran through Rochester, passing just on the southern side of both the medieval manor and the village of Northfleet, on its way to London. In the Middle Ages this road was still the principal thoroughfare in Kent and since Saxon times had been known as "Watling Street." I believe that the migration of the original Norfleet family(s) out of the parish was primarily along this road both to the east and the west. This migration probably commenced during the Twelfth and Thirteenth Centuries and these people, after their departure, became known as the people "from" (in both Latin and French the corresponding preposition is "de") Northfleet, the term becoming a hereditary surname by the end of the Fourteenth Century. This hyperlinked map shows a view of Watling Street in northeast Kent during the late Middle Ages. Of all the people identified in the above list, John de Northflete is worthy of special attention. He was a Master of Merton College, Oxford, and was in his prime during the early years of the fourteenth century (see references 11, 12 ,13, 15 and 16 of the above list). 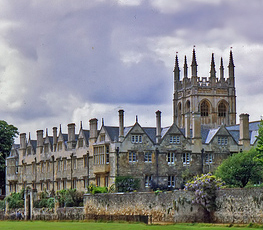 In those days, Merton was the largest and most prestigious "secular college" (meaning a college not associated with a religious order such as the Dominicans or the Franciscans) at Oxford. Master John was at Merton during what has been called the "Great Mertonian Period", when the College housed many great men of exceptional intellectual ability such as Thomas de Wilton, John Dumbleton and Richard Swyneshed. In addition, John de Northflete was a contemporary of the great Franciscan philosopher William of Ockham (of "Ockham's Razor" fame) who was at Oxford circa 1307-1320. In his own right, John de Northflete, must have been considered to be of some consequence himself, as he obtained the recognition of Pope John XXII, by being provided with a papal benefice in 1317. A year earlier, in 1316, King Edward II had appointed Master John as Rector of the Church of All Saints, Oxford, in the Diocese of Lincoln. In 1317, the King presented him with the Church of Amyngton, Oxfordshire County, in the Diocese of Lincoln. In October, 1319, King Edward II Presented John de Northflet with the rectorship of the Church of Amyngton, Oxfordshire County, which was also located in the Diocese of Lincoln. Finally, towards the end of his life, Master John was appointed Rector of the Grafton Parish Church, in Northamptonshire County in July 1334. He served there until his death in January 1335. Robert Northflete � A Lucky Felon! "Whereas Robert Northflete, cook, on Monday after the Conversion of Saint Paul, 22 Richard II, at Neugate, London, before John Warnere and John Wade, Sheriffs, and John Michel, Coroner, became approver and acknowledged himself to be a robber and felon and charged William Chapman, dwelling opposite the Friars Manor at Luchefeld, Stafford County, with having with himself on Saint Stephen's Day in the same year at Luchefeld in the household of the late King stolen divers silver vessels of the said King and other magnates to the value of 20 Pounds, of which each had a moiety, and also with having at divers times between Christmas and Epiphany in the same year at Luchefeld in the household of the said King within his palace there stolen divers silver vessels of the said King and other magnates, weighing 18 pounds by the estimation of the jurors in a certain inquisition, each pound being worth 26 shillings, and the said Robert on Tuesday before the Conversion of Saint Paul was taken with the vessels so stolen by him in the Parish of Saint John Zakarie, in the ward of Aldrichegate, London; the King hereby pardons him." Robert Northflete was a very lucky fellow. His crime, being a felony, was punishable by death in those days. However, his crime was committed during the last year of Richard II, the last Plantagenet king of England. Within a few months, Richard II was overthrown by Henry IV, a member of the House of Lancaster. One of the first things King Henry IV did, upon coming to power, was to pardon the prisoners of the prior monarch! 1. Kate Tiller, English Local History An Introduction (1992), pages 118-120. 2. Frank W. Jessup, Kent History Illustrated (1973), page 26. 3. William Page, Editor, Victoria History of the County of Kent (1932), Vol. 3, page 134. 4. The quotation is from the Calendar of Wills Proved and Enrolled in the Court of Husting, London, Part I, A. D. 1258-1358, page 274. 5. I last examined this document in April 1995. The seal has deteriorated from the last time I had previously examined it, in the 1980s. It is now fragmented with about 1/3 of the seal being entirely absent. The existing portion is in two fragments, one fragment is completely detached from the will. The seal appears to be in no way unusual, just a standard seal ordinarily used by members of the Cathedral staff to authenticate documents.